Actually I meant to start the blog with a more light-hearted, less political post. But it bugs me to see red literally everywhere I look these days. What’s the deal with poppy mania?! To make it totally clear, I don’t mind Remembrance Day per se or people showing solidarity with the families of soldiers killed in service. What I do mind is the omnipresence of poppies. Seems like the majority of people I see on the street at the moment wear a poppy! I am woken up by the BBC in the morning and the first thing I see when I open my eyes are the poppies on the presenters’ lapels. I grab a newspaper, the front page is adorned by a poppy. Walking through our little town last Sunday, I counted as many as seven (7!) volunteer couples selling them on street corners. Don’t dare to imagine how many I might have missed. Frankly, I feel like an outcast NOT wearing one. I have a hard time going out these days because I am constantly afraid someone will shout at me for not sporting a damn poppy! 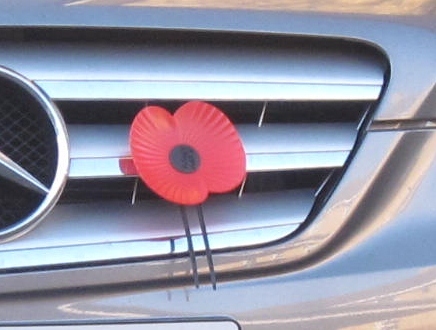 Am I even allowed to get onto a bus with a poppy on the grill if I’m not member of the holy poppy brotherhood? Apparently, my fear isn’t entirely unsubstantiated. Check out the ongoing debate about Channel 4 News anchor Jon Snow. Looks like there are people insisting every TV presenter wear one. Why???!!! Now, I don’t want to question people’s motives for wearing one. Could be anything from actually mourning a fallen friend, showing support for the troops overseas (what business do they have there anyway, but I guess that’s a topic for another day) to wanting to financially support the charities that sell them. But why is it that seemingly most of the people I see wearing them are commuters from London in their suits (not last Sunday obviously). Is there something to the views of Robert Fisk that “all kinds of people […] were now ostentatiously wearing a poppy for social or work-related reasons, to look patriotic when it suited them”? Oh, and get the public outcry because the FIFA dared to ban the English football team from having a poppy on their jerseys in their match against Spain this weekend (it is FIFA policy not to allow ANY statements, political or otherwise, on the shirts). Thank god, following personal intervention of charming Prince William, they now got their way and can wear poppies on armbands this Saturday. I’m sure each and every player on the team will be absolutely delighted! Incidentally, has anyone ever calculated the environmental impact of gazillions of poppies sold and discarded later? Think about it.